Club hikers got a treat today up on the Bristlecone Trail in the form of up to 8 inches of snow on the ground. Two club members set out to pre-hike an easy hike along the valley north of Spring Mountain Ranch State Park. It was good to do a pre-hike for this trail since portions of the trail are very faint and junctions are difficult to locate in some instances. Nevertheless, the hike is a good one and includes a couple of hills, beautiful rocky washes and views of the Red Rock Canyon NCA escarpment from beginning to end. 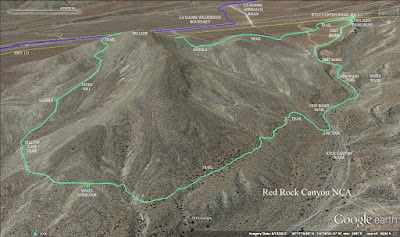 This trail can be connected by other trails along the same line to have end points at the Red Rock Overlook pullout on Highway 159 and Spring Mountain Ranch State Park. The total mileage for the entire length one way would be around 4 miles. 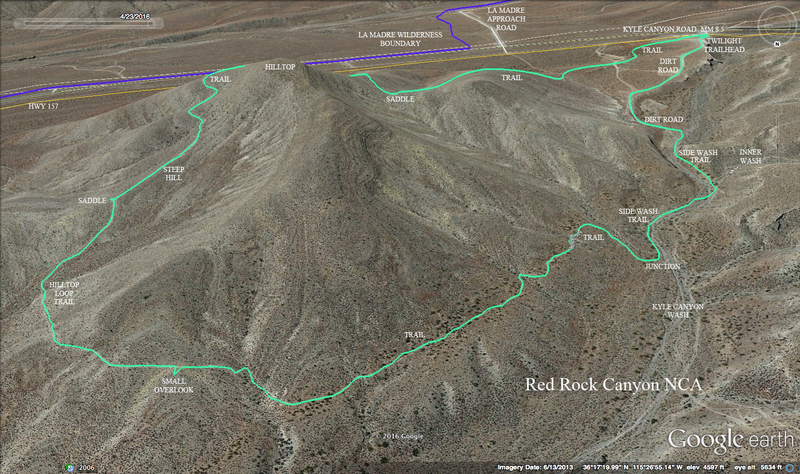 We began at the Scenic Loop Exit and turned around at the First Creek Trail for a 5 mile out and back hike. 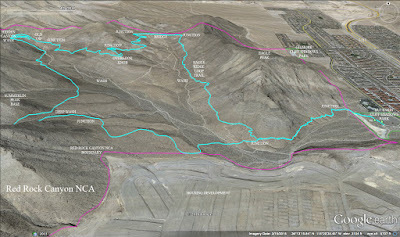 Within our hike, there was a partial loop which increased the hike's interest. We experienced light rain for most of the return hike and enjoyed seeing only a handful of other hikers and several rabbits and lizards. So! 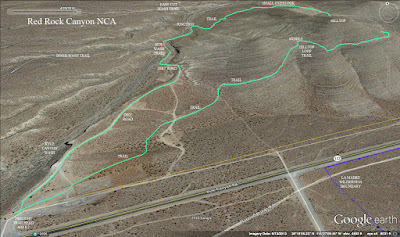 There is a large system of bike trails in the Summerlin Peak area of Red Rock Canyon NCA out of the two Cliff Shadows parks! The trails are old and very clear. 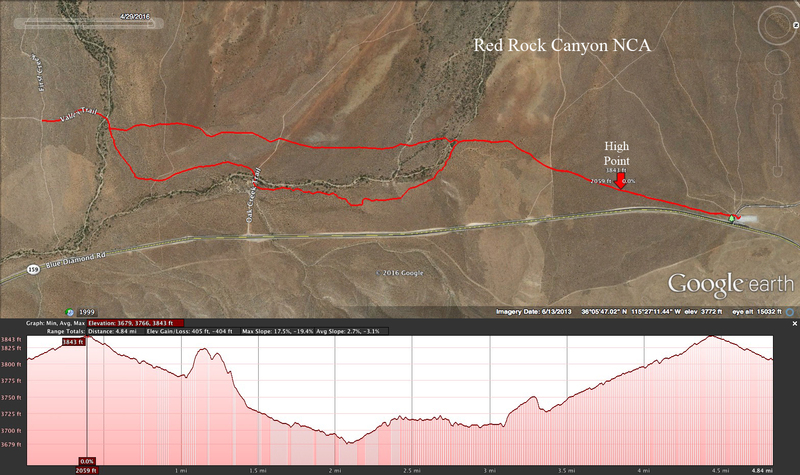 Today, thirteen club members mapped out a very nice route starting at the Buckskin Cliff Shadows Park which included a trip deep into Hidden Canyon where a rock climbers' slot turns up into the mountainside. It was a beautiful day for the lower elevations of 3000 to 3500 feet. The temps were in the high 60's and a cool breeze continued to blow past. We left out of the right (NE) side of the park and climbed up to the Eagle Ridge Loop Trail to turn to our left. As we circled around the end of the mountain ridge, we were very high above the wash to our left. An interesting rocky short climb gave us a short thrill of exposure then we junctioned at a trail crossing. We continued straight. 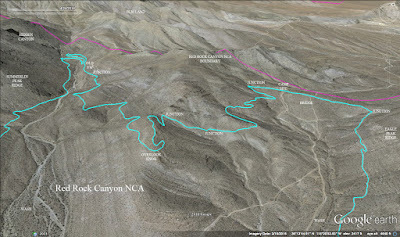 This took us down to cross the wide wash with the benefit of a trail. Up to our left was a swath of land that had been razed for a housing development. As we crossed the wash, we were being watched by a cave dweller high up in the Eagle Ridge. He had a nice view of the Las Vegas Strip. 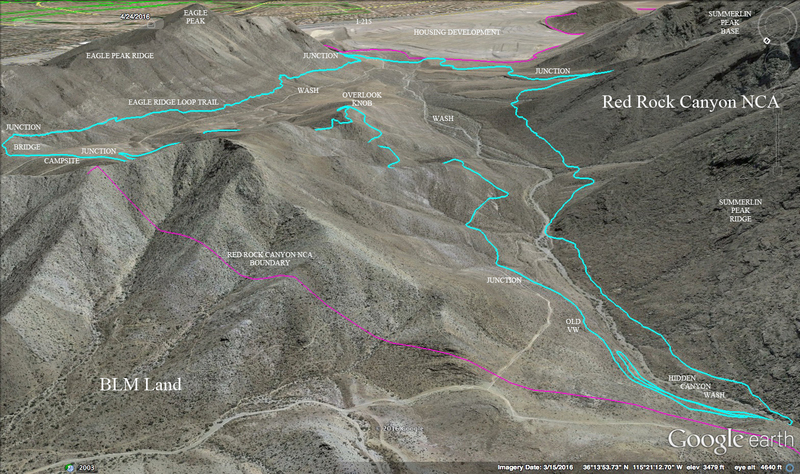 Our trail led us up and up as we headed into a small canyon inlet at the base of Summerlin Peak. We climbed along a deep wash then crossed the top of it. As we dropped down the other side of the deep wash, we passed by a very large cave. Inside the cave, we saw a tent and rocks for sitting. There was a person in the tent but we didn't bother him. At any rate, the person's cave was also in the high rent district. Very nice. Out of the inlet, we continued along the base of the ridge above. 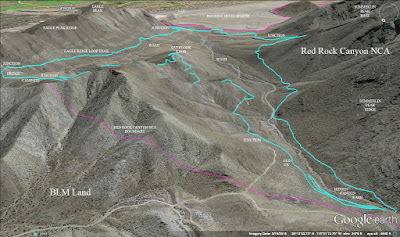 We noted the routes that we usually use to climb Summerlin Peak and wondered if our trail might improve its hike. We passed the very steep down slope that we had used a few years ago to descend the ridge above then our trail passed over a couple of limestone slabs. We wondered if the slabs were difficult for bikers to negotiate. 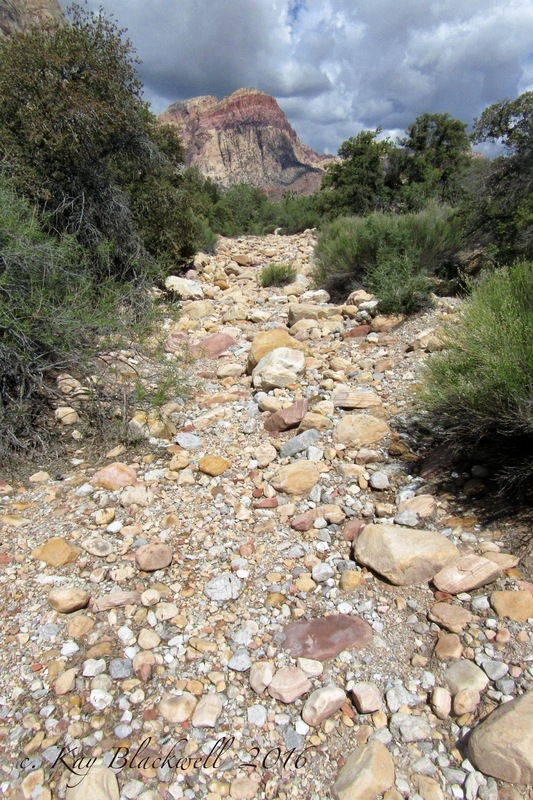 Our trail passed through another large wash and a few more slabs then it dropped down to the wash below. A limestone wall stood in front of us to prevent the trail from continuing on the same contour. When we reached the wash, there was a lone biker patiently waiting for us to get out of his way. There was no way that we could all fit on the trail anyway! The trail climbed up the gravel wash for about 50 feet then headed back up the side of the mountain. Now, we could see Hidden Canyon in the distance. There were several rugged sections of trail here so, our concentration was needed. At the apex of the trail in the canyon, we saw another person sitting on a rock. By the time we reached the rock, the person was gone. We never saw him again. As we approached the narrows, we noted a large nest built on a tiny ledge in a limestone wall. (See photo below.) At the time, we could not tell what kind of nest it was but, later, we saw a red-tailed hawk flying around as he hunted. Perhaps it was his nest. Just past what would be a good scramble up the wash, we saw the deep crevice of the Hidden Canyon slot turning to the left. It was far enough away that we did not want to go and investigate. The limestone wash below us was smooth and beautiful. We thought about taking our break here but decided to go on up a little further. 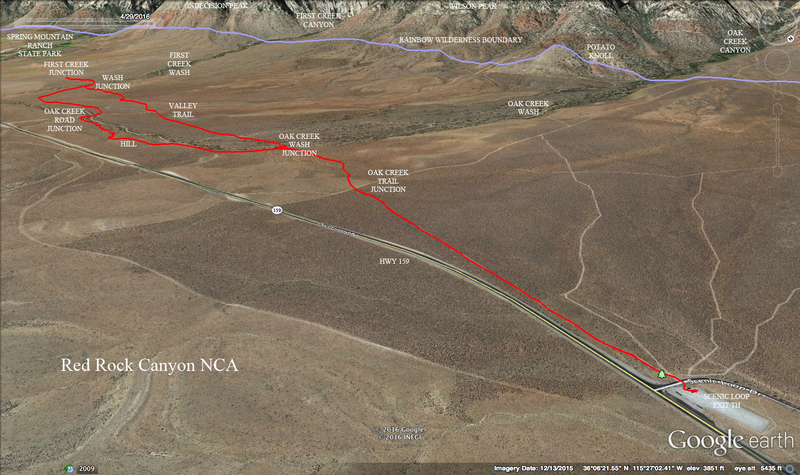 Across the canyon, we could see the long switchbacks of the trail that would take us up the other side of the canyon. So, we climbed the switchbacks then came upon an old shot up Volkswagen Beetle sitting upside down next to the trail. A little more climbing and we could feel a nice breeze. Here, we took our break with a view of Hidden Canyon on one side and the Las Vegas Strip in the far distance on the other side. Afterwards, we climbed more as we contoured in and out the small canyons coming off of the mountainside. A small overlook knob was the turnaround point for the trail and we headed back up a rocky ridge. This ridge was the high point for the hike today. The rocky ridge had steep drops on either side of it and also held our last view of Hidden Canyon. As we looked behind us, we saw an interesting peak above Hidden Canyon. We never figured out its name. At any rate, its elevation is 4341'. The trail switchbacked a couple more times in this area then we came to a trail junction. If you continue straight here, you climb to the highest section of these bike trails. Wanting to work our way over to the other side of the canyon to our right, we turned right to descend a steep-sloped trail. This brought us to another trail below where we turned left. Again, we began the ins and outs of the little mountain canyons. The group was patient with the extra mileage. The trail was still the easier way to go most of the time. Finally, we reached the area above a terrain bridge that led over to the other side of the canyon. 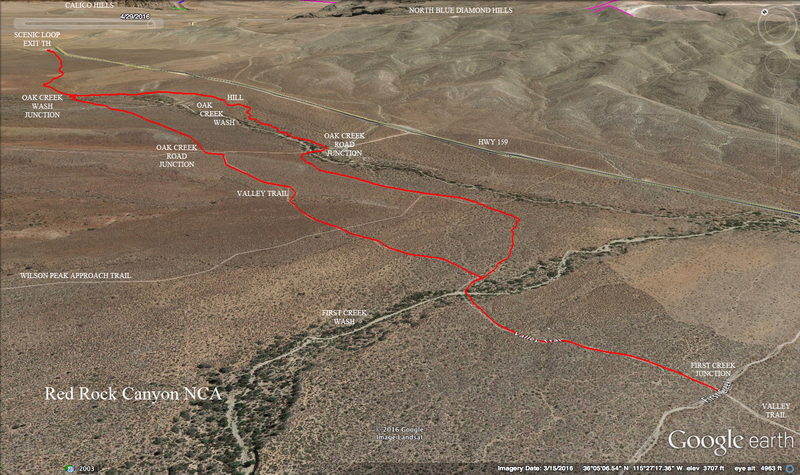 We bushwhacked down missing several curly Q's of trail. 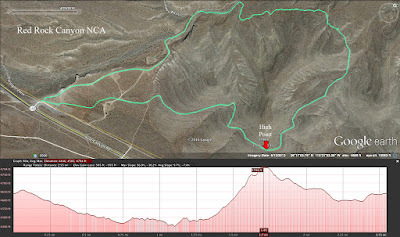 The Hilltop Loop is a short equestrian trail that begins out of the Twilight Trailhead located 8.5 miles up Kyle Canyon Road on the right side. Seven or eight years ago, this parking lot is where hired horse rides were available. The large hitching post railing is still there. 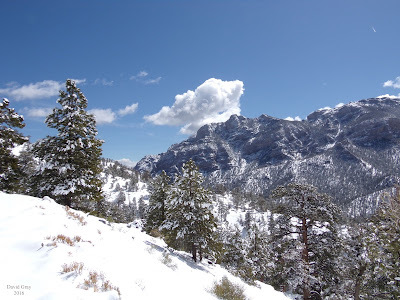 Now, this area is used mainly for mountain bikers but also equestrian and hiking endeavors. For the second hike in a week, we returned with one more hiker than we set out with so we had a total of eleven hikers within the boundary of Red Rock Canyon NCA. The hike began up the dirt road that followed along the large Kyle Canyon Wash below us to the left. The dirt road took us down to the wash where we walked down through the large gravel. There is a small side trail on the left side of the wash. We took this trail then crossed the wash at the Inner Wash junction and took another side trail on the other side until the Hilltop Loop junction on the right. Along the wash, we noted several kinds of blooming flowers including desert sage, princess plume, and cliff rose. After taking our right turn, we began a gentle climb and started noticing that many of the joshua trees had fruit on them. It seemed unusual to see so many of the fruits! We climbed a bit before we left the west side of the Hilltop and stopped at a small overlook. To the north, we could see the upper portion of the Paiute village. To the south, the snow capped mountains rose above the desert. After a nice rest, we continued up the trail. The next climb was a little steeper. It took us to the first saddle. 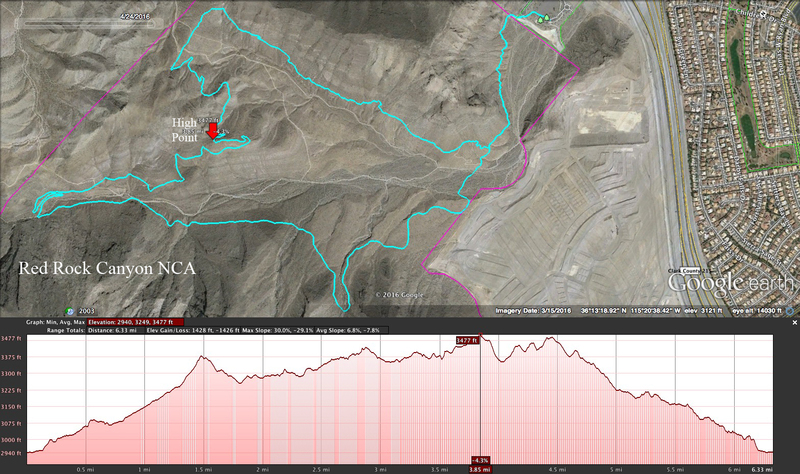 From there, we noted the steepest climb presented itself to the right. Prepared for the ascent, eleven leisurely hikers took on the hill with strength and fortitude. In no time, we were at the top where the trail led around to the east. A little more gentle climbing and we found ourselves at the hike high point. There is a cairn here. If you wanted to climb to the top of Hilltop, this is where you would want to start. As the descent began, we took in the gorgeous views of Charleston Peak, La Madre Peak and Mummy Mountain. Cars on Kyle Canyon Road below us appeared as small as ants. We could also see our cars at the trailhead far below. The trail circled around to a second saddle then descended off of the hill. Our route crossed a dirt road and kept a straight line in front of us. This small trail angled slightly to the right as it took us up and over a hill before reaching the north end of the large parking lot trailhead. This is a short and sweet hike that served us well in the fresh wind today.